The street festival is off due to the predicted rain. Though live music and performances will not be on the streets, the public is encouraged to check out the other First Friday events happening in the area. Porsche Kelly, aka The Poetic Activist, is a spoken word artist from Oakland, dedicated to performing gut-wrenching, heartfelt poetry with a passion for social justice, including fighting against racism, sexism, and human trafficking. She aims to speak truth with raw and unapologetic lyrics, inspiring others to rise up and fight for justice. Nomadic Press is a 501(c)(3) not-for-profit organization that supports the works of emerging and established writers and artists. Through publications (including translations) and performances, Nomadic Press aims to build community among artists across disciplines. An Oakland based punk-rock band that originated in 2003 with 30 albums, Elegant Trash performs as much as humanly possible. With current members Lee Hoffman (vocals and guitar), Nathalie Hoffman (vocals), Denny Joints (bass), Waverly Cook (drums), and Philip Thorneycroft (lead guitar). Robot Nature formed January 1st, 2017 when singer and multi-instrumentalist DPAK was introduced to Richard Parizer, Michael Skelena and Jesse Shadis. An eclectic synthesis of modern electronic, noir pop and infectious synth-rock elements blend pulsing violins and haunting melodies, fused with electronic EDM to create the signature Robot Nature sound. Join in the drumming circle. Soul Beatz is an eclectic group of individuals who started in the Ashby Bart Station, but have since become one of the best and well-known drum circles in all of Oakland. The band welcomes all people to participate, and kids absolutely love it! With background experience in rapping and singing, DJ Joogmac has an understanding not just of new sounds and club rhythms, but also of bringing crowds together. Come out and support this Bay Area talent! A multidisciplinary artist, whose primary medium has been DJing. Drow Flow is a Nashville native by way of Chicago, and his mission is to transform perspectives through creative expression. An accomplished DJ, drummer & artist, Elembe Blaise, has traveled and played music all over the world. 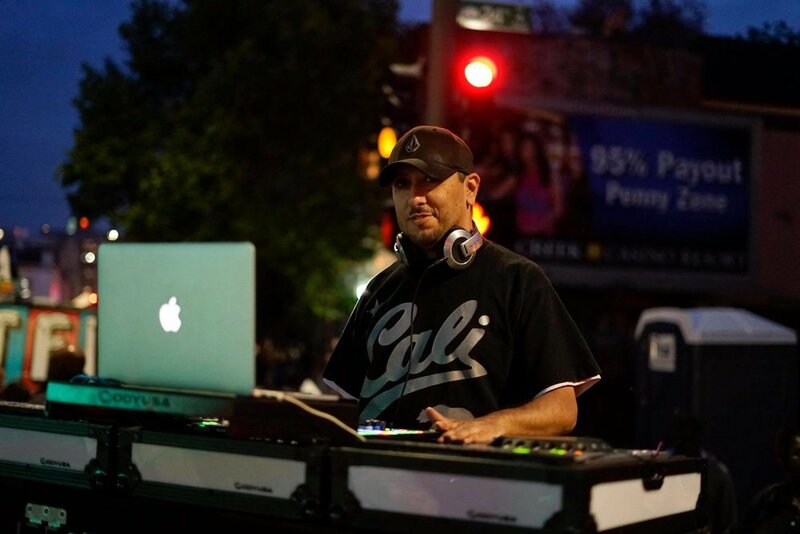 With a vast catalog of music, specializing in African, World, Reggae, Roots/Dance Hall, Bhangra, Salsa, Reggaeton, Funk and Soul, Jazz and Hip Hop, DJ Elembe has the ability to seamlessly mix all genres of music that bring crowds to the dance floor. TURF Inc. works with inner-city kids to teach provide an engaging way of keeping youth off of the streets. Come support the youth showcasing their skills with Oakland and the world.